· SANIFAX SEGUIRÁ ADELANTE CON MÁS RAZÓN EN SU QUERELLA CONTRA CHILLÓN POR LA VÍA PENAL. * EL JUEZ LE LLAMA A DECLARAR EL DÍA 3 DE DICIEMBRE. EL MUY MENTIROSO VA DICIENDO POR AHÍ QUE SE HABIA ARCHIVADO. HOY PUBLICAMOS INTEGRO EL AUTO DEL JUEZ. * SIGUEN ADELANTE LOS PROCESOS JUDICIALES CONTRA TERESA ALFAGEME, "DIRCOM" DE LA OMC. LA PASADA SEMANA TUVO LUGAR EL ACTO DE CONCILIACIÓN, PREVIO A LA PRESENTACIÓN DE QUERELLA CRIMINAL DE SANIFAX CONTRA EL PRESIDENTE DEL COLEGIO DE MÉDICOS DE MADRID, CHILLÓN. 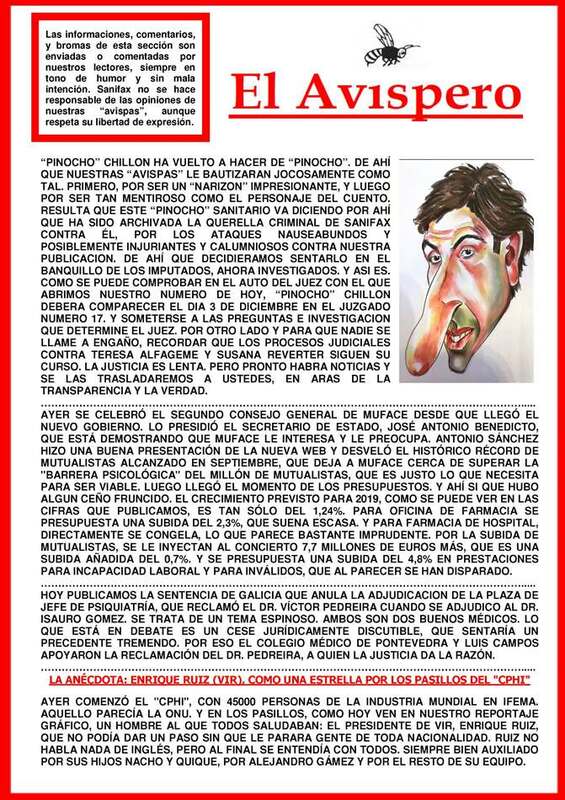 LA ACTITUD DE SANIFAX ERA DE MANO TENDIDA: CON QUE CHILLÓN HUBIERA ESCRITO UNA CARTA PIDIENDO DISCULPAS Y RECONOCIENDO SU ERROR Y HUBIERA HECHO UN DONATIVO A LAS HERMANITAS DE LOS POBRES DE MÁLAGA (NOSOTROS NO QUEREMOS NADA), CUESTIÓN ZANJADA. PUES A PESAR DE LAS TERRIBLES CALUMNIAS E INJURIAS QUE VERTIÓ CONTRA SANIFAX, LE HUBIÉRAMOS PERDONADO.